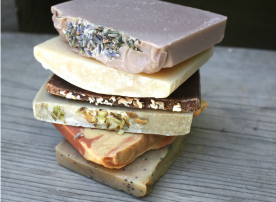 Welcome to the Backwoods Soap and Body product line! All items are handmade out of hops and/or beer from the Pacific Northwest. From creative beer soaps to hop infused balms and candles, we have a wide variety of options for the beer lover in everyone. Each soap is crafted to bring out the best notes of the beer it was made with, from the hops and yeast sourced in our beautiful PNW backyard. We aim to provide natural products for consumers with these very unique body products, ranging from fragrant artisan soaps to 100% natural options. Don't you dream of bathing in beer? Soaping Tip: "New to using natural soaps? Their lifespan can be increased dramatically by placing them on a soap dish out of direct contact with water."